We’d love your help. Let us know what’s wrong with this preview of Farewell Waltz by Milan Kundera. And so begins a comedy in which, during five madcap days, events unfold with ever-increasing speed. Klima's beautiful, jealous wife; the nurse's equally jealous boyfriend; a fanatical gynec Klima, a celebrated jazz trumpeter, receives a phone call announcing that a young nurse with whom he spent a brief night at a fertility spa is pregnant. She has decided he is the father. And so begins a comedy in which, during five madcap days, events unfold with ever-increasing speed. Klima's beautiful, jealous wife; the nurse's equally jealous boyfriend; a fanatical gynecologist; a rich American, at once Don Juan and saint; and an elderly political prisoner who, just before his emigration, is holding a farewell party at the spa, are all drawn into this black comedy, as in A Midsummer Night's Dream. To ask other readers questions about Farewell Waltz, please sign up. How do Czech people feel about this book? The Farewell Waltz (Czech: Valčík na rozloučenou) is a Czech-language novel by Milan Kundera published in 1972. A French edition was published in 1976 and an English version entitled The Farewell Party. This novel mostly deals with love, hate and accidents between eight characters who are drawn together in a small spa town in Czechoslovakia in early 1970s. Ik proef de Oost-Europese sfeer in deze roman...de typisch Oost-Europese setting. Het verhaal past in de tijd, toch is het thema universeel...ontrouw met een daaruit voortvloeiende zwangerschap...alle personages/verhalen zijn op ingenieuze wijze met elkaar vervlochten. Milan Kundera heeft een makkelijk leesbare en toch intellectuele schrijfstijl...fijn!! 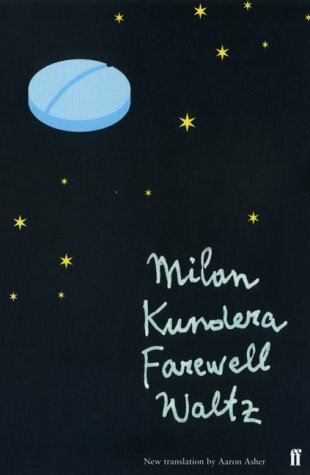 The Farewell Party is Kundera's third novel. The story has a very theatrical approach to comedy: we have eight equally obnoxious characters, none of whom have a central role. However each of them are a pivotal element in the plot. The characters are introduced one by one in a remote spa-town in Czechoslovakia, set in the early 1970's. Under the comedic theme of the novel, there are darker undertones of coercion, blackmail, seduction, infidelity and even murder. Kundera uses perspectivism to show each character's unique viewpoint and logic in carrying out their (often questionable) deeds. I absolutely adored the writing on this novel. Kundera's charming wordplay and his use of sexual politics are present here in its full glory. He also touches up on some political themes as it is written after the Soviet invasion and the crushing of Prague Spring. Here we are as in the theater: unity of place (almost) time unit. We are plunged into idleness of a spa town, those that frequent the beautiful world in the century before last. Here we are in a "vaudeville of waters" of the blow, where in five days and as many chapters, the comic and the tragic intertwine as for a last waltz, casual and grave at the same time. In a jiffy you enter the dance, tempted by this waltz feelings of unbearable lightness, grabbing the pace off this crossover of heterogen Here we are as in the theater: unity of place (almost) time unit. We are plunged into idleness of a spa town, those that frequent the beautiful world in the century before last. Here we are in a "vaudeville of waters" of the blow, where in five days and as many chapters, the comic and the tragic intertwine as for a last waltz, casual and grave at the same time. In a jiffy you enter the dance, tempted by this waltz feelings of unbearable lightness, grabbing the pace off this crossover of heterogeneous identities, perceiving melody misleading falsehood escorting love triangles, savoring the mischievous song of a mocking destiny that plays with its victims in the course of misunderstandings and hazards. - "رقصة الوداع"، واحدة من افضل الروايات التي ستقرأها يوماً! - ميلان كونديرا يستطيع نسج رواية بنسق تصاعدي من دون ان يعتري النص اي ركود او ملل وهو يستطيع ادخال شخصيات جديدة عند منعطفات رئيسية في الرواية بكل سلاسة فلا يشعر القارئ ان هذه الشخصية زائدة او اسقطت من دون معنى، بل على العكس من ذلك تكون الشخصية اساسية في المسار اللاحق للرواية وتمتلك ارتباطاً عضوياً مع الشخصيات السابق ذكرها. - الأحداث تنطلق من فكرة (اكتشاف حمل) اثر ليلة عابرة بين روزينا (الممرضة) وعازف البوق، تقض مضجع الأخير فيذهب ليحاول اقن - "رقصة الوداع"، واحدة من افضل الروايات التي ستقرأها يوماً! - الأحداث تنطلق من فكرة (اكتشاف حمل) اثر ليلة عابرة بين روزينا (الممرضة) وعازف البوق، تقض مضجع الأخير فيذهب ليحاول اقناعها بالإجهاض وتبدأ الأحداث بالتواتر بطريقة كوميدية حينا ودرامية حيناً بوليسية في احيان اخرى، فيجعلك ميلان تتبع عدة مسارات في الوقت ذاته وعدة افكار متوازية من دون اي ضياع او ملل بل بتحليل دقيق لنفسيات الشخصيات والغوص في ابعادها وتناقضاتها. - الأفكار: الكثير من الأفكار في هذه الرواية لعل ابرزها الحياة والموت، العيش وطرقه وتأثيره في كل شخصية، الحب والجنس (لكن ليس على الطريقة العربية)، الدين والإيمان والعقل، الإنسان كمحورية للحياة او كسببية. الغيرة والشك... ولعل اهم ما يميز ميلان هو طريقة طرح هذه الأفكار بإسلوب الصدفة (او القدر). - كتب ميلان هذه الرواية قبل مغادرته تشيكوسلوفاكيا، ولعل شخصية "جاكوب" هي اسقاط لذاته وتوق للخروج والهجرة كان يعتريه. أولى تجاربي في عوالم كونديرا الفلسفية برواية جيدة ذات فلسفة بسيطة عن الحياة، تحتوي على العديد من الشخصيات والأفكار المختلفة كليًا لكن تتشابه في محاولة السعي إلى حياة أفضل. شخصيات الرواية كل منهم يريد الحياة، كل منهم يرى أن ما يفعله صحبحًا، جميعهم يرون الخطأ صواب طالما يتوافق مع أهوائهم، طالما سيعطيهم فرصة أفضل للحياة. من قرأ لكونديرا ولم يفهم رواياته، أو شعر بأنه ضائع بين أحداثها ومعانيها، لن يشقى مع هذه الرواية كثيرا ً، نشر كونديرا هذه الرواية في سنة 1972 م باللغة التشيكية، كان لايزال يعيش في تشيكوسلوفاكيا – سيعيش منفيا ً في فرنسا بعد ثلاث سنوات، وسيحصل على جنسيتها في سنة 1981 م -. تنويه: ما سيأتي قد يكشف شيئا ً من أحداث الرواية. إذا كنتَ قارئا متطلبا، فهذه واحدة من الروايات الجميلة التي قد ترضي غرورك ..
العمل الفكري واضح ومرهق، و"الملاحقة النفسية" التي يرتكبها كونديرا لمشاعر كل شخصية، أفعالها وردودها يثير الإعجاب ويقترب من حدود المبالغة ..
الرواية "ضيقة" في مساحتها الزمنية، 5 أيام فقط، لكنها بالتأكيد قادرة على تلويثك بالقلق المحبب، ولزمنٍ ممتد وشاسع ..
Il titolo Il valzer degli addii, restituisce una idea esatta della struttura di questo romanzo: un valzer a più voci in cui la vita di un gruppo di personaggi si intreccia per coincidenze fortuite e non, in una alternanza di incontri, di quiproquo, di amicizie di volteggi di amori cominciati, abbandonati, ripresi. Abbiamo un medico ginecologo provvisto di delirio di onnipotenza che si dedica con ardore alla cura di donne con difficoltà procreative, spendendo se stesso in prima persona tanto da me Il titolo Il valzer degli addii, restituisce una idea esatta della struttura di questo romanzo: un valzer a più voci in cui la vita di un gruppo di personaggi si intreccia per coincidenze fortuite e non, in una alternanza di incontri, di quiproquo, di amicizie di volteggi di amori cominciati, abbandonati, ripresi. e poi c’è un facoltoso uomo d’affari americano, malato di cuore che professa ad un tempo un pieno entusiasmo per la vita, una religiosità pura non disgiunta da un certo libertinaggio innanzi l’età che avanza. Tutto si svolge in una stazione termale boema un po’ decadente e triste come lo sono tutti i sanatori in genere, (evidentemente i sanatori siano topoi molto amati dagli scrittori), la storia segue lo spazio temporale di quattro giorni. Amo Milan Kundera, e da tempo non tornavo ai suoi libri, l’ho adorato ne L’insostenibile leggerezza dell’essere, qui siamo piuttosto distanti da quei vertici di bellezza, è un Kundera in tono minore, anche se la capacità di mescolare sapientemente il suo afflato filosofico con la narrazione tout court non viene mai meno, in più in questo romanzo c’è un elemento direi quasi inconsueto nelle sue storie, come una tensione quasi da giallo, seppur molto blanda, che incita a voler conoscere l’epilogo della storia. Tra le pillole filosofiche sparse nel libro, una mi ha colpito molto: privilegiati e felici sono coloro che leggono libri o coloro che possiedono un cane, (chi ha i due requisiti allora è un privilegiatissimo). Milan Kundera is such a misogynistic egotist, that it's difficult for me to remember why I liked this book so much, until I open it up and start glancing through the pages again. First off, the plot of this novel is amazing, hilarious, interesting, and totally unconvincing. Which is part of Kundera's charm, ironically. He utilizes these absurd characters, that are completely unbelievable, puts them in a situation that would never happen in a thousand lifetimes, and then these unbelievable events Milan Kundera is such a misogynistic egotist, that it's difficult for me to remember why I liked this book so much, until I open it up and start glancing through the pages again. First off, the plot of this novel is amazing, hilarious, interesting, and totally unconvincing. Which is part of Kundera's charm, ironically. He utilizes these absurd characters, that are completely unbelievable, puts them in a situation that would never happen in a thousand lifetimes, and then these unbelievable events do happen to those unrealistic people amounting to a conclusion that forces you to question what we you know about morality, life, and murder. He does this very well. من المفترض أني كتبت ريفيو البارحة لكن يبدو أن التطبيق لم يحفظه كما اعتقدت..
عن الحياة والموت..هذان هما الخطان الأساسيان الذين تدور حولهما أحداث الرواية و عن خيارات الحياة الكثيرة التي تمنحها لنا أو تلك التي لا تكون كثيرة ، مع ذلك نسير في حياتنا لا نعرف أحيانا ماذا تخبئ لنا و أين تكمن الخطورة والجمال وال من المفترض أني كتبت ريفيو البارحة لكن يبدو أن التطبيق لم يحفظه كما اعتقدت..
عن الحياة والموت..هذان هما الخطان الأساسيان الذين تدور حولهما أحداث الرواية و عن خيارات الحياة الكثيرة التي تمنحها لنا أو تلك التي لا تكون كثيرة ، مع ذلك نسير في حياتنا لا نعرف أحيانا ماذا تخبئ لنا و أين تكمن الخطورة والجمال واللذة..
ان تجمعك اجمل صدفة مع كتاب ، فهما حاولت ان تنتقده فلا اتصور ان ذلك سيجدي نفعاً ، هذه الرواية من ضمن نوع الروايات التي افتخر بقرائتها ، لا اشعر ان هناك اضاعة للزمن ، في كثير من احداثها اقترب من وضاعة المجتمع و سخريته من العاطفة ، يُنصح بقرائتها اثناء سماع ( Those where the days ) ، من القلب شُكرا ميلان . ميلان كونديرا لذيذ , ليست أفضل ممّا قرأته قبل " كائن لا تحتمل خفّته " و " الخلود " ولكنّه كونديرا الذي يجدّد بخبثه و عبثه و فلتاته ساعة الانتباه للمفارقة و الحلاوة في قلبك المليء من ضجر الساعات و الكلمات التي لم تأخذ حقّها من الذكاء ! كونديرا عن سؤال الولادة .. و القتل ... و الإنسان ... و الأنثى أوّلاً ! Những câu chuyện trong các tác phẩm của Kundera xoay đi xoay lại vẫn là chuyện giữa đàn ông và đàn bà với một vòng tuần hoàn: Tình yêu - Ghen tuông - Chán chường. Không có gì mâu thuẫn hơn và dễ nứt vỡ hơn một mối quan hệ giữa đàn ông và đàn bà - đặc biệt là khi một trong hai suy nghĩ về ý nghĩa của mọi thứ. Đoạn kết của tác phẩm này khiến tôi nhớ đến Closer - một bộ phim tôi cực thích. Nếu như ở Haruki, hoạt động tình dục là một công cụ giúp một cá nhân (rất cô đơn) kết nối với người khác và qua đó là kết nối với cả thế giới nên nó cần phải thật, tỉ mĩ và trụi trần thì tình dục trong sách của Milan lại có tính biểu tượng (?) như là phương cách giao tiếp duy nhất dễ chịu giữa đàn ông và đàn bà, đơn giản và ấm áp. Sau đó thì mọi chuyện trở thành thảm họa! Cài 1 tình tiết về viên thuốc độc màu xanh của câu chuyện, tác giả đã bẻ ngoặt câu chuyện ra theo một góc không ai ngờ, từ đó, mở ra vô vàn chiều kích cho câu chuyện cũng như cho tâm trí độc giả. Chuyện gì sẽ xảy ra sau khi người ta kết thúc một điệu Valse và đèn phụt tắt? Tác giả không nói, người đọc không rõ nhưng họ biết, có nhiều thứ rất quan trọng đã thay đổi. Giọng văn của Milan, dẫu giàu tính triết lí đến vậy, ông vẫn đủ khả năng lột tả được những cảm xúc rất thật của mỗi cá nhân, đến mức tôi không tìm nổi ra ai để ghét trong dàn nhân vật. Đọc Milan, tôi không thể đọc một mạch mà phải đọc từng đoạn nhỏ thôi. Như thể nhiều ngóc ngách trong cả tư tưởng và cảm xúc của tôi đã bị đèn LED chiếu thẳng vào (không hãnh diện gì khi phải thú nhận là mình có máu phát xít và căm ghét con người). Đàn ông và đàn bà, ôi trời, họ khác nhau nhiều quá. Còn tôi ư, trời ạ, tôi giống đàn ông nhiều quá. How can a book not grab your attention where the ‘hero’ wears a necklace with a cyanide pill so he can make a conscious choice every day whether or not to live? Kundera writes a farce, a sexual farce, in five parts, and in his typical fashion, he transforms it into something more ambiguous and much, much darker. As Jakub drives across the border never to return to his homeland (as Kundera) you wonder how this seemingly good man’s conscience allowed him to commit a bad act. Again, we see all these How can a book not grab your attention where the ‘hero’ wears a necklace with a cyanide pill so he can make a conscious choice every day whether or not to live? Kundera writes a farce, a sexual farce, in five parts, and in his typical fashion, he transforms it into something more ambiguous and much, much darker. As Jakub drives across the border never to return to his homeland (as Kundera) you wonder how this seemingly good man’s conscience allowed him to commit a bad act. Again, we see all these all these choices, all these possibilities, all these potentials for man. And, many are dark. Kundera is asking if we really know what we are capable of. In an interview Kundera said “In The Farewell Waltz, the question is, does man deserve to live on this earth?” Written in Czechoslovakia in 1972 following the Soviet crushing of Prague Spring, I imagine I could appreciate the sentiment. In addition to the story line, what makes reading Kundera so worthwhile to me , is his incredible insights. Nearly the entire book is quote worthy. این به خوبی در تمامی آثار کوندرا معلومه. همین ها باعث ایجاد سو تفاهم ها ، کژ فهمی ها ، و... میشه ،و جالب که ما آدمها با تمام این تفاصیل ،به خودمون اجازه می دیم که روی سطحی ترین وجه شناختمون ، دیدن و یا شنیدن قضاوت کنیم و یا حتی عدالت رو اجرا کنیم،غافل از این که آدمی پیچیده تر از این داستاناست. این کتاب رو دوست داشتم و از خوندنش لذت بردم. للحب ألاعيبه، كما للسياسة تمامًا، وإن كان الحب أكثر سعة وقدرة على الغـدر..
هذه المرة يغادر "كونديرا" ميدانه المفضّل الأول، ليكتب عن الثانى..
يكتب "كونديرا" عن شخصياته فتحيا وتتفرد فى تصرفاتها، وتصبح تلقائية تفعل ما ترى وتسير الطريق إلى آخـره فى سلاسة..
عازف البوق وزوجته ومعشوقته الممرضة ومثلث الرعب الأبدى..
"سكريتا" و "برتليف" والمشروعات السرية والخيانات الزوجية وحالة التبنى الغريبة..
هكذا تحيا تلك الشخصيات المنفصلة، المتصلة، فى عالم ينسج للحب ألاعيبه، كما للسياسة تمامًا، وإن كان الحب أكثر سعة وقدرة على الغـدر..
هكذا تحيا تلك الشخصيات المنفصلة، المتصلة، فى عالم ينسج "كونديرا" معالمه الخارجية ويترك شخصياته لترسم التفاصيل الصغيرة..
كالعادة، ترجمة "محمد التهامى العمارى" غاية فى الروعة..
"— Nesta terra, as pessoas não respeitam a manhã. Acordam brutalmente ao som de um despertador que lhes rasga o sono com uma machadada e entregam-se logo a seguir a uma pressa funesta. É capaz de me dizer o que será depois um dia que começou com semelhante acto de violência? Que será feito dessas pessoas a quem o despertador ministra diariamente um choquezinho eléctrico? De dia para dia, vão-se habituando mais à violência, cada vez mais esquecidos do que seja o prazer. Pode crer-me, o temperamen "— Nesta terra, as pessoas não respeitam a manhã. Acordam brutalmente ao som de um despertador que lhes rasga o sono com uma machadada e entregam-se logo a seguir a uma pressa funesta. É capaz de me dizer o que será depois um dia que começou com semelhante acto de violência? Que será feito dessas pessoas a quem o despertador ministra diariamente um choquezinho eléctrico? De dia para dia, vão-se habituando mais à violência, cada vez mais esquecidos do que seja o prazer. Pode crer-me, o temperamento de um homem é decidido pelo que forem as suas manhãs." Não. Não é um romance acerca de despertadores. Mas estas personagens irritaram-me tanto como o "trrim trrim" da manhã. As sete, sem excepção. O tema é a procriação; e os acontecimentos ocorrem numa estância termal, cujas águas dão esperança às mulheres estéreis. أُحبُّ الحبَّ في روايات كونديرا ، في "رقصة الوداع" ظهر الحبّ الكبير الجامح الذي ينتهي إلى حبّ صلب عنيد ممزوج بغيرة مركّزة لا تعرف التّشتت ، هذا الحبُّ عادة أقلّ خدشٍ على سطحهِ يهشّمه ..
Η ιστορία αγγίζει τα όρια της φαρσοκωμωδιας και συνδυάζει το προσωπικό δράμα των ηρώων με την κατάσταση της κομμουνιστικής Τσεχοσλοβακίας. Με μεγάλη ψυχογραφική επιδεξιότητα ο Κούντερα προσεγγίζει σε βάθος την ανθρώπινη συνείδηση μέσα από συμπτώσεις και κωμικές ανατροπές, με μαύρο χιούμορ που πολλές φορές παγωνει το χαμόγελο στα χείλη. Με αυτό το βιβλίο ο Κούντερα "αποχαιρετά" , μαζί με τη χώρα του, τη συγγραφή σκοπεύοντας να ειναι το Βαλς το τελευταίο του βιβλίο. Ευτυχως δεν ήταν. On my bookshelf at home, Kundera sits alongside Saramago, Marquez, Kafka and the like in a space reserved for the mavericks-genius and eccentric in equal measure (Kafka is there by popular consent. I have not had the courage to read him yet) Even in this group, Kundera stands out – a peculiar oddball in a sea of oddballs. And the Farewell Waltz is emphatic proof for that. - Klima, a celebrated jazz-trumpeter at On my bookshelf at home, Kundera sits alongside Saramago, Marquez, Kafka and the like in a space reserved for the mavericks-genius and eccentric in equal measure (Kafka is there by popular consent. I have not had the courage to read him yet) Even in this group, Kundera stands out – a peculiar oddball in a sea of oddballs. And the Farewell Waltz is emphatic proof for that. -	an ex-rebel living his last days in the country before his emigration. The story happens over 5 days starting from the moment when the trumpeter gets the dreaded call from the nurse. That incident sets in motion a chain of events that draws in all these characters to the spa town. And these are events that in the hands of any other author are extremely significant and would be handled with the appropriate gravity, drama and even melancholy. But not Milan Kundera. He weaves issues concerning Love, Betrayal, Infidelity, Friendship, Death together with an effervescent lightness. In fact, that lightness is the one constant in all of Kundera’s works. And it provides the fodder for all of the book’s humor. 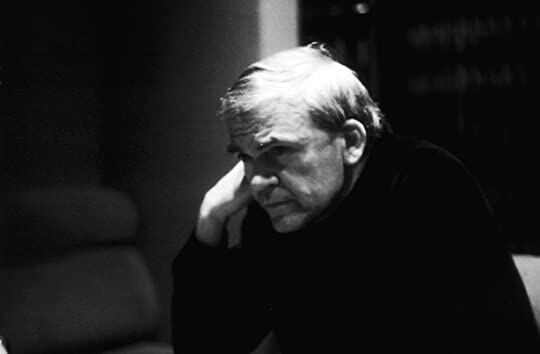 Every important thing that Kundera wants to tell the reader is told through the interaction between characters. This means that his subjects do relapse into philosophical monologues but never at the expense of the central narrative. In fact, they are often both funny and thought-provoking (and that makes it true comedy if you ask me). “There isn't a man in this world who isn't capable, with a relatively light heart, of sending a fellow human to his death. At any rate I've never met one. If men one day come to change in this regard, they'll lose a basic human attribute. They'll no longer be men but creatures of another species'. 'You people are wonderful!'... 'When you turn everybody into murderers your own murders stop being crimes and just become an inevitable human attribute'. These quotes give a clearer picture of Kundera and his fiction than I can ever hope to achieve with my own words. Like all great fiction, it is better read than read about. One curious fact before I stop though. There are many exquisitely crafted characters teeming his pages, yet none of them stay with you once you finish reading. It is as if they existed only to further the author’s vision of the world. And at the end of his novels, all of these characters continue to live their pre-destined lives in spite of all that happens. As if none of it really mattered. Maybe, it is in keeping with his philosophy of lightness. In the end nothing really matters. رقصة الفالس التي ارتجلها ميلان كونديرا ليجعل عطاء المرأة و عطاء الرجل يتراقصان على ركح الحياة جنباً لجنب ، من يحدد بينهما أحقيته للبقاء ومن سيشدو لحن الوداع الذميم قبل الآخر !.. رقصة فالس معيارها العطاءات تجعل المتراقصين على أنغامها أمهر وأكثر احترافية من خريجي الكونسير فتوار !. ضمن إطار الصراعٌ الطبقي السياسي الذي تشهده منطقة استجمام علاجية نائية تقصدها نساء يعانين العقم و اختلالات صحية أخرى تسمى مدينة المياه ،تدور أحداث رواية (فالس الوداع) فتحكي قصة روزينا الفتاة التي تحاول التمرد على محيط منطقتها الضيق وتحلم بالخروج للحياة والهجرة من مدينة المياه (تقبّ على وجه العالم كما نقول ) و وسيلتها في ذلك حملها الذي تريد إقناع عازف الترومبيت المشهور (المتزوج) أنه سبب حدوثه ، و من جهة أخرى الدكتور سكريتا الذي يحلم بالهجرة بدوره باحثاً عن فضاء أرحب يمكنه التسلق نحو طبقة اجتماعية أرقى و وسيلته خداع مريضاته بحقنهن بسائله المنويّ الذي يثبت نجاح علاجه المزعوم.. تاركاً في أعقابه نسخ حية من هوسه بالصّيت الذائع لا أكثر، نطفٌ يحملون صفاته الجينية ،وجهه و وحمة فوق شفاههم بحيث لا يشقّ على البصر التعرف على والدهم الحقيقي ، روزيتا و د سكريتا.. من منهما سيكون عطاءه أسخى للحياة بحيث يرقى به طبقياً و اجتماعيا قبل الآخر، من يبتزّ القدر ويقتطع بحدّ شفرته نصيبه بأقل خسائر ممكنة ! الهجرة مشجب كونديرا.. لحل مشكلة التفاوت الطبقي لمست هذا في أكثر من عمل له. مدينة المياه اسم رائق ومتناغم .. إذا ما اعتبرنا الماء القنطرة الأولى لوصولنا لبر الأرحام سالمين (ألم نخلقكم من ماءٍ مهين ) ، ولعلنا ندرك المسوّغ وراء الحكمة الإلهية من التحذير من أختلاط المياه هنا، فاختلاطها لا يعني بذراً بالضرورة ؛ بمقدار ما يعني تشويه للخليقة ككل ، حُوين طليق عشوائي الوجهة كفيل بصنع جيل تائه !.. ؛ فكلنا نحملق ولكن وحدهم المحلقون يحرضون الصّورة أن تنطق ! سنجد على الغلاف المرأة الحامل المسترسلة في أحلام يقظتها ترنو للحياة بعينين ساهمتين و الرجل الذي إذا ما عزف بمزماره كوّن حاشية منقادة لذلك العزف مسلوبة الإرادة بمقدوره تجيّيشها كيفما شاء ، كما فعل عازف المزمار بجرذان المدينة في قصص الطفولة. بعيداً عن الجمال والموضوع والتشويق والمتعة وما إلى ذلك .. الكتاب الذي يجعلك تتوقّف لتتفكّر بعمق في نفسك وفي علاقتك بالأشياء من حولك وفي دورة الحياة بأكملها ، هو كتاب أدّى الغرض المطلوب منه تماما . كونديرا مرةً يلخّص سيرورة حياة كاملة في خمسة أيام مليئة بالأحداث ، ومرة يكتب رواية بدون أحداث تُذكر وبنفس الدرجة من القدرة على التأثير ..
أيّ جنّي يكتب معك يا كونديرا !! بیشتر از حرفهایی که تو کتاب میخونیم برای من طرز نگاه کوندرا به جزییات و تحلیل رفتارها و افکار شخصیت های کتابه..
من این کتاب رو دوباره باید بخونم..و همینطور بار هستی رو..
شاید هم تصمیم بگیرم تمام کتاب های کوندرا رو پشت سر هم بخونم. كلما مررت بفترة عصيبة على المستوى الشخصي، يرافقها التفكير المضطرب والأرق وضغوطات العمل والإجهاد الجسدي والنفسي، أجدني لا شعورياً أميل إلى رفقة #ميلان_كونديرا. هو وحده من يستطيع أن يجتثّني من بقعة الضوضاء تلك، ويزرعني حيث أجد تفسيراً لكل ما يكتنف النفس البشرية من غموض. وكعادته يكتب كونديرا للقارئ غير التقليدي، القارئ الذي لا ينزع إلى غربلة العمل الأدبي مع الميل المسبق إلى ترجيح كفة الاستياء دون الإصغاء لهتافات الاستحسان التي تصدر من أفواه النص حين يُعامل ككلٍ متكامل لا حاجة إلى تجزئته وتقسيمه. في #رقصة_الوداع يظهر كونديرا "الفيلسوف" كعادته في كافة كتاباته. يقوم بتعرية الحقائق التي نغضّ الطرف عنها طوعاً وكرهاً، ينزعها كجذورٍ تواريها تربة الحياة القاتمة، يحاول أن يلفت انتباهنا إلى ذلك الجزء الغارق في عتمة الذات، ويدفعنا إلى تقبلّه والاعتراف به، إذ نرفض كوننا بشراً إن لم نقم بذلك، وفي الرفض حماقة لا مبرّر لها. لا أحد يجرؤ على فعل ذلك كما يفعل كونديرا. المُلفت في هذه الرواية هو أنك ستجد صعوبة في تحديد بطلها. بطولة هذا العمل كانت أشبه بقالب كعك تشاركته جميع الشخصيات على مائدة النص الخلّاب. وإلى جانب الحوارات التي يُديرها الكاتب بذكاء بين أبطال الرواية، تقف العبقرية سامقة في حقل الحوارات الذاتية والصراعات الداخلية لكل شخصية على حدة. I grew to hate certain characters, as if they were made of flesh and blood; I pitied some...and some, I just didn't understand. Why, why do they get involved in such complicated matters, when everything could have been solved so simply? But, that is Kundera, and that is how he presents life to us. It's a string of seemingly simple, non-related events....details which, in the end, prove to alter one's life forever.